This is a 150 sq. ft. Timbercraft Tiny Home in Guntersville, Alabama. And it’s built by Doug Schroeder who has been a home builder for 20 years. 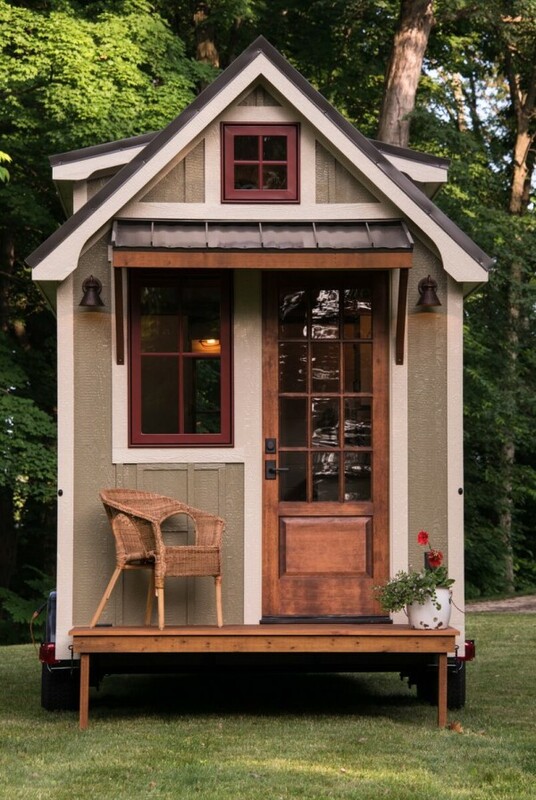 His company, Timbercraft Tiny Homes, is now offering 20′, 22′, and 24′ models of tiny houses on trailers. With the 24′ option you can even go with double lofts for even more space. How would you like living tiny in this little cottage on wheels? Let us know in the comments. You can share this Timbercraft Tiny House with your friends and family for free using the e-mail and social media re-share buttons below. Thanks. Alex so glad you posted this. This is almost the exact layout I created and same sq footage!!! My trailer is 21′ I needed a good visual Love it!!!! So warm and inviting – like a cozy little cottage. Well done! My favourite! I love timber frame homes. This would make a great runner up! Love all the really clear pictures that show this TH so nicely. A little small for what I am looking but well done. This is the most beautiful tiny home I’ve ever seen. I’ve never commented before. But I had to this time. The colors, the decor, it’s just beautiful. The layout is practical, and I love the openess of the extra space created by the roof structure in the loft. The best storage I have seen in a tiny house. Great job. Excellent interior as well. Beautiful, and the craftsmanship is evident. I only have 1 problem, and I’m sure it was done this way due to Mr. Schroeder’s 20 years of home building. In order to have eaves (which appear to be about 3″), he had to reduce the width of the home by about 6″, therefore losing about 10 sq ft on a 20′ length. That might not seem like much, but it’s about 6.25% of the home, which is significant. I like eaves, as they protect the sides of you home, but losing that much home just doesn’t make it for me. Other than that, just about perfect! Anxious to know prices and delivery time. Chester, please email me or give me call at 256-558-8410 and we can discuss prices and availability. Nuff said, the pictures do all the talking! Beautiful attention to detail. Lovely light coming through well placed windows. Welcoming colors. I am sure this builder could build any ones tiny dream home with the features they desire. Thank you for sharing. There’s something very calming about this interior design. Finishes are very classy; love the light fixtures and shower faucet So! Well done. But I would like to see is more Tiny Homes that are longer and wider since most of them are not going to be moved around. I can picture this one 10 ft wide and 36 ft long. There’s a lot packed into this 150 square foot tiny house. Great design both inside and out. Well done. I would like one of your tinyhouses with barn doors inside a Mainfloor bed room not pulled out from under a floor. Loft up stairs for storage,kitchen,bath with shower and flushing toilet , only one side loft and a gathering room.somewhere for my sister to sleep when she visits.and a secret panel for special things. And what ever else I could have .i am a widow with a parrot and two dogs.thankyou hope to hear from you and “$”. ? Mary, thanks for your interest. Please email me at [email protected] and I would be glad to get your specs and give you a price. I really LOVE your home! Beautifully done,and very well thought out!! Wow. This is gorgeous. I think the design is beautiful and the interior looks like something in a magazine. Yet it seems very inviting and livable. I absolutely love the attention to detail. Thanks Mr. Schroeder for sharing, I’m bookmarking this because my (very small, though not a tiny house like this) house has so much potential and I could never put together a color scheme or details that looked right, and this is exactly what I was looking for. This is beautifully done, the years of experience building can be seen in this home…however, two comments – there doesn’t appear to be any flashing around the eaves and gables of the roof, just the overlapping metal, so I was wondering how this will hold up in the long term. Aesthetically speaking it does look nice, but curious as to what time will do. Second, despite the absolute beauty and detail of this home I would pass in purchasing it due to a very simple lack of a bathroom sink. I will *not* use my kitchen sink for washing my hands for toileting, nor will I keep toothpaste, brush, and other bathroom accessories at my kitchen sink, no matter how close it is; bath activity and kitchen cooking are two items that need to be kept *separate*. I agree with you. Denice I think there should be a sink in the bathroom. Hola realmente muy buena diseño colores y cuanto cuesta esta? The nicest I’ve seen, no doubt. There’s certainly some potential/usable space neglected (note the fenders protruding from the sides…every inch matters in a tiny house on wheels; see Dan Louche’s designs for a comparable, albeit slightly wider look), but I have yet to see such beautiful work. Well done Doug! Ricardo: mucho dinero! Ver el enlace web arriba. I would love this house to be built outside width 10 ft and length 28 not including porch or tongue. That would make the inside width 9.2 and the length after walls up 26.8. You can then have bathroom 3.8 wide and have a sink in it. Make the kitchen area 8ft long,have 15 ft left for stairs to loft and still have plenty of room for living area. This home can be moved but not used as a traveling home. I saw this Tiny House in Indiana before it was finished (Doug was still building the kitchen cabinetry), and I was super impressed with his craftsmanship. It’s beautiful inside and out! It’s great to see these photos of the completed house! The colors, the beautiful door and windows, the cabinetry- all of it- fantastic!! Good luck, Doug with Timbercraft Tiny Homes! Wishing you all the best! I think it is the choice of colors that makes this home so appealing. What a lovely TH! One of the nicest planned and executed tiny houses that I’ve seen. Much thought went into storage needs. Bravo! To top it all off, the decor, both inside and out, is most attractive. Love this home from top to bottom! Definitely my favorite tiny home on wheels that has been featured, ever. Beautiful job! I love all of your craftsmanship it’s beautiful!! The details that you put into your home, I really love your kitchen cabinets and I love how you continued that style to house your your closet and your clothes hamper. I love all the windows and your floors. Your tile work in your shower area, is gorgeous!! I took your email address down for future reference for when I’m financially ready to invest in purchasing a tiny home. As I said your work is beautiful!! Thank you so much for sharing!! I love this tiny house. How much would the house featured cost? Extremely nice tiny house…! I could only wish I saw how much it cost…! Im interest in knowing the paint colors used on this tiny house & the brand of paint. If somesomeone could..get me the information would..be excellent. Ive asked before yet no response: ( thank u! Is there plans for this tiny house?